Bottle Gourd is known by various names in India - Doodhi, Lauki, Ghia. It has a mild, almost neutral taste that goes well with most things. 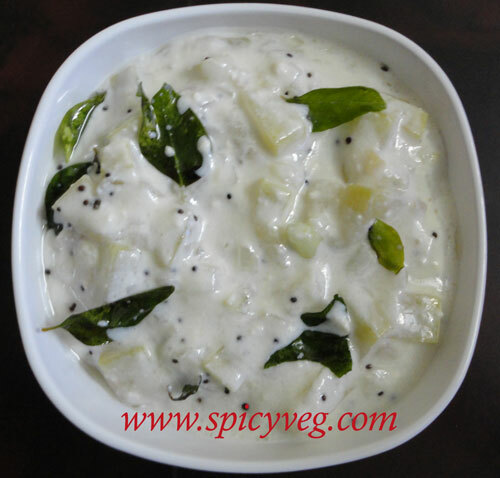 Combined with yogurt, as in this simple, tasty dish, it tastes great with pilafs and dals(lentil dishes). Raitas are normally bland,as they are meant to act as a side dish for spicy main course dishes served as part of a traditional meal.However,here is a slightly spicy raita that can combine well with spicy as well as bland main course dishes.Revel in the goodness and cooling effect of lauki/ doodhi/bottle gourd and protein rich curds,in one single dish.If you are fussy about milk, this raita is an ideal meal time feast to meet your protein and calcium requirements. Protein - 4.5gms per serving. 1.Combine the bottle gourd,onions,green chillies,ginger and 1/2 cup of water in a deep pan,mix well and cover and cook on a medium flame for 10 to 12 minutes or till all the water evaporates. Keep aside to cool. 2.Add the curds,peanut powder and salt,mix well and keep aside. 3.For the tempering,heat the oil in a small pan and add the mustard seeds. 4.When the mustard seeds crackle,add the curry leaves and onions and saute on a medium flame for 2 to 3 minutes,while stirring continuously. 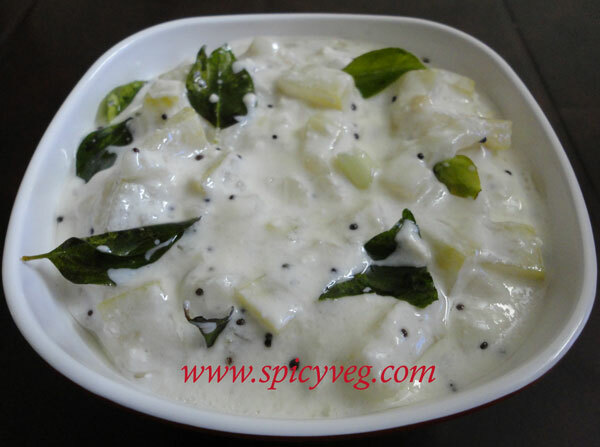 5.Pour the tempering over the curds - bottle gourd mixture and mix well. Serve immediately.